Happy Sunday! This verse hit me anew this past week as I focused on the "peace that comes from Christ" phrase. Seems to me that a whole lot of strife is running our lives. And even though we are working to find peace, folks are living in states of unrest because we are relying on ourselves to find that peace. 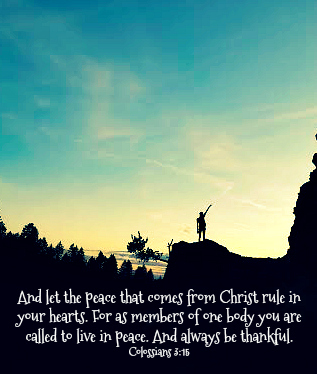 We MUST let our peace come from Jesus! In this busy season with full calendars, tight wallets, and political turmoil, it is imperative that we spend not less, but rather more time with Jesus. Take an extra few minutes in the morning to read a devotional or the Bible, pray a little more throughout the day, spend more time thanking God at the end of the day and let HIS indescribable and unmatchable peace wash over you. It is sad, that so many, are so unwilling, to yield to Christ, during these humbling times. I dislike all the unrest but after years of worrying I am now at a place where I can tune it out and rest on my Savior. Amen, I can't imagine not having Jesus to lean on!